Persistent property in Star Citizen comes in various types such as ships, weapons, vehicles, and land. Land ownership works via permanent control of an area or outpost. Outposts in Star Citizen are permanent player constructed housing that can be placed at a remote location. This means there are several types of land where players can place outposts. Claimed land refers to land where a contract has been issued by the local faction that oversees that land. For example, at a UEE controlled location the land claim would be filed with the UEE. Unclaimed land refers to areas of space where an outpost is placed without the issue of any claim license. This means it is completely up to the discrepancy of other player and NPC characters to attack or loot the outpost without interference from other factions. "The land claim system will be important beyond Pioneer construction. Land claims will prevent other players from building in your territory and will offer different options relevant to gameplay (such as giving you surface rights, for pure construction, versus mineral rights that would include mining.) We know that there are concerns that land claims could theoretically be abused (situations such as buying up the area outside a major city or using outposts to block important areas); rest assured that the claim system is being developed to prevent these situations from being possible." Land claims in Star Citizen will offer various types of protection depending on factors such as how dangerous the area is or the frequency of NPC patrols. This means your outpost will be secure from looting unless you place it in more dangerous areas. The most dangerous option is to place your outpost without any claim or on someone else's claimed land. While dangerous, this option also allows for more freedemon in outpost construction as a player willing to take the risk could build any type of structure on the outpost as opposed to just the type allowed for in land claim options allowed by factions. For example, if there is a planet where mining is forbidden but you place your outpost on land that is uncontrolled, it would be possible to build a mining outpost illegally without a land claim or outside of land claim permits (assuming land claim allows for farming but not mining). While some of this information is our own guess, since at the time of writing Land Claims are still in concept, we think it will end up being somewhat similar based on the official information that has been released so far as well as by analysing the actual logistics of how these things could work. Can I Discover New Land For Claiming? Yes. Players who come accross new claimable land will be able to file a claim with the appropiate authorities or occupy the land at their own peril. What Professions in Star Citizen Require Land? Land Size - How Big Is My Land? Land size in Star Citizen will take up 1x1 pixel on the map. While this information is still in concept, it is estimated to be between 4x4km and 8x8km in area. What size is the Pioneer claim license included in the package? It will depend on the texel density of our resource map, we want to make sure the claim is at least 1×1 pixel on that map. The initial educated guess is somewhere between 4×4km to 8×8km. 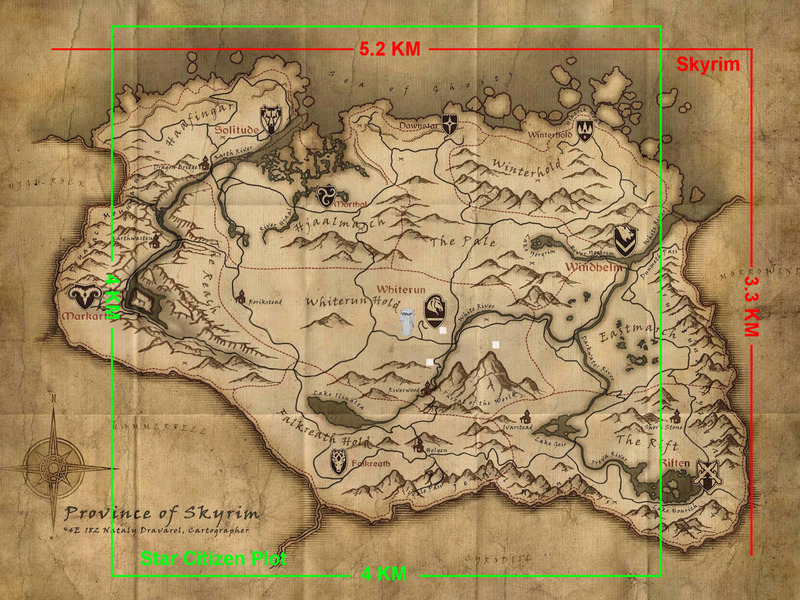 To put things into perspective, this is fan made image comparing the playable size of Skyrim with the smaller 4x4km land claim plot in Star Citizen. It seems each Land Claim gives players their own control over a rather large playable area. We have created an image using the Reclaimer as seen from above. Since the Reclaimer length is 155 meters we have estimated the yellow square around at the shown scale for the land claim of 4km x 4km.